As I mentioned earlier, Maggie had a few birthday celebrations this year. 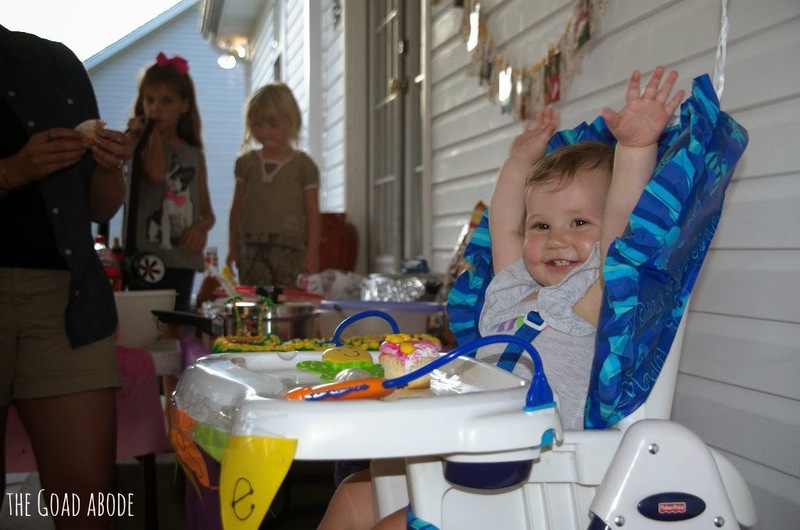 We got to celebrate her first year in Tennessee with Brandon's family. Brandon and Maggie celebrated on her actual birthday (while I was in Indiana for work) with his dad and his family in Illinois. And finally, once our travels had concluded, we celebrated with a small group of friends in our home. 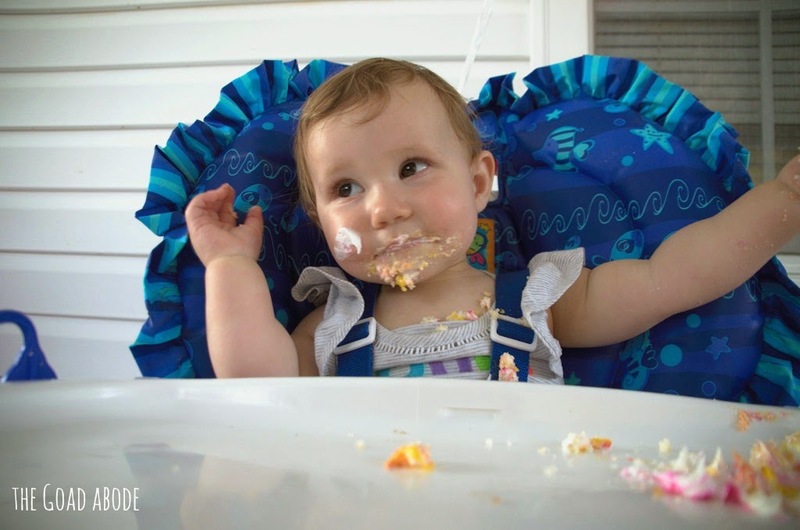 It was a special celebration and we invited friends who had been an important part of her life this first year. Because most of them had older or no children, we decided to do something a bit unusual for a one year old's birthday; we had a Sole Hope Shoe Cutting Party. For the first hour of the party, we cut fabric that will be sent to Uganda and made into shoes for children who do not have them to protect their feet from jiggers (a nasty sand flea that burrows into their feet). If you follow me on Instagram, you may have seen these photos there. For more info on how you can host your own shoe cutting party, go to Sole Hope Party and order a party packet! After we had cut enough fabric for six pairs of shoes, we had dinner and ate cake! 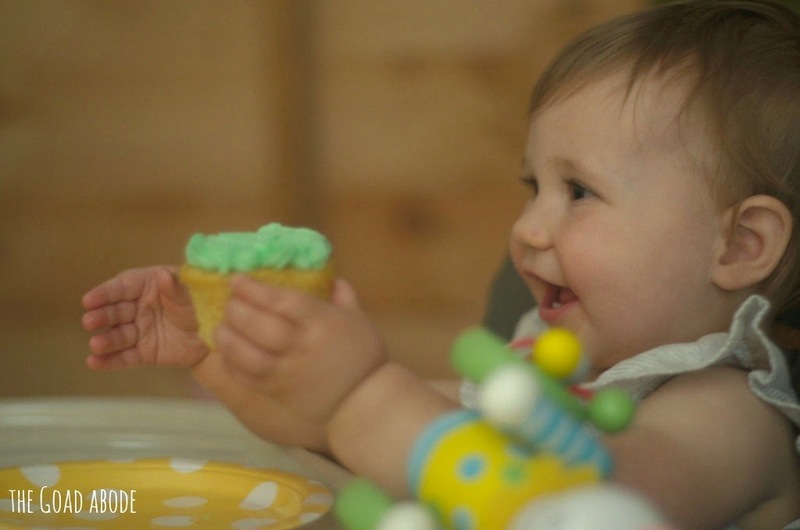 As you can see, she knows exactly what to do with that cupcake! 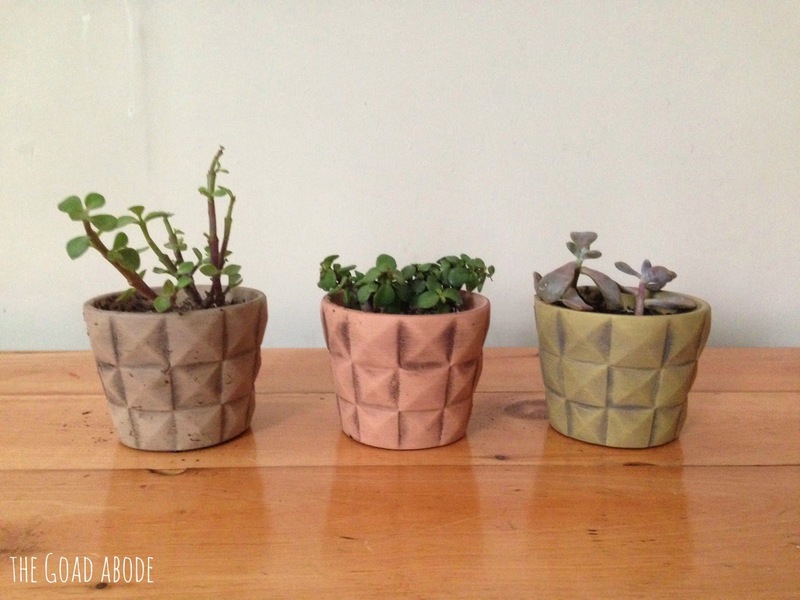 I had high hopes for getting back into my blogging rhythm this month, but clearly that didn't happen. Instead, I tried to enjoy my time off and not worry about the online world. That worked for a few days, and then Maggie got sick and so did I. We've had hand-foot-and-mouth, which I've realized is one of the more painful kinds of sicknesses you can get (or maybe I'm just a wimp). So my full week of vacation was sabotaged (yes, I'm being dramatic). There was no trip to the zoo, playdates or time with good friends, as I had planned. Instead, we had some good snuggle time, lots of practice for Maggie to use her walker (she still hasn't taken a step on her own yet) and homemade popsicle consumption. Maggie's first birthday had multiple celebrations because I had to travel for work the week of her birthday. As much as it killed me to be away from her on her actual birthday, we were able to make the most of the situation by taking a family trip south where Maggie got to meet several relatives for the first time prior to my work thing. Unfortunately, we were not great about taking photos with the various family members she met. 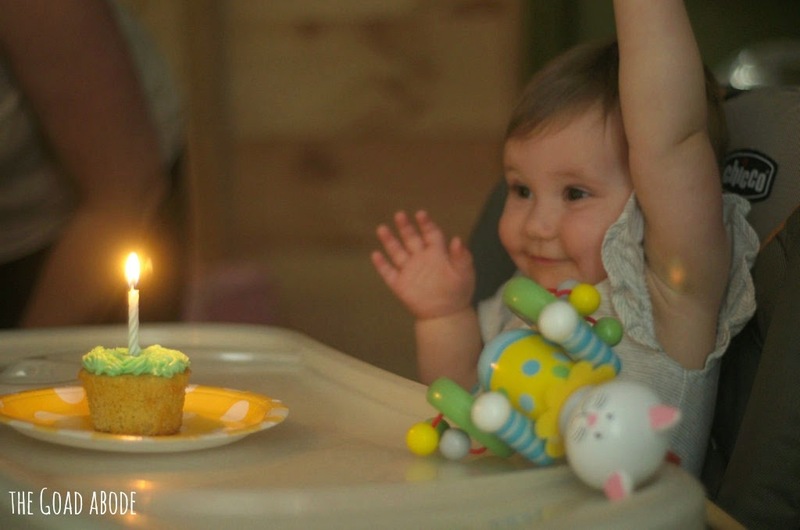 But we did get some great photos from her first birthday celebration which was a few days before her actual first birthday. Curious George seemed fitting because we always call Maggie our little monkey. Whenever I watch the cartoon, I think they must have based the sounds Curious George makes on a 1 year old. Her gestures and sounds are so much like his! 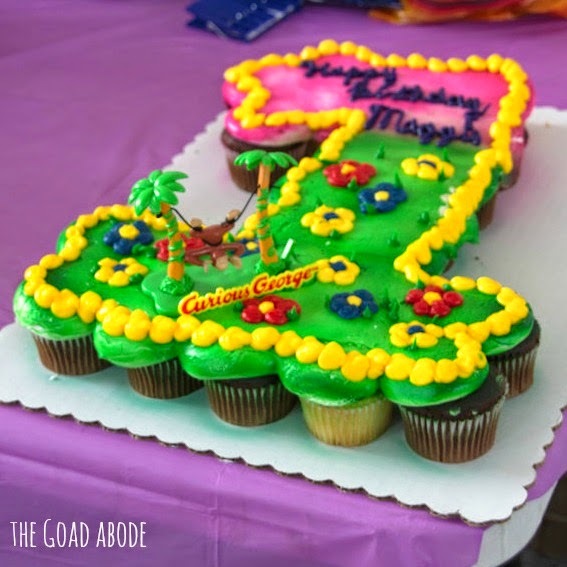 Maggie liked the cupcake, flipping it upside down and eating the cake first. Then she got into the frosting and probably ate too much of that (it was a rough night of many wakeup calls for mom and dad). 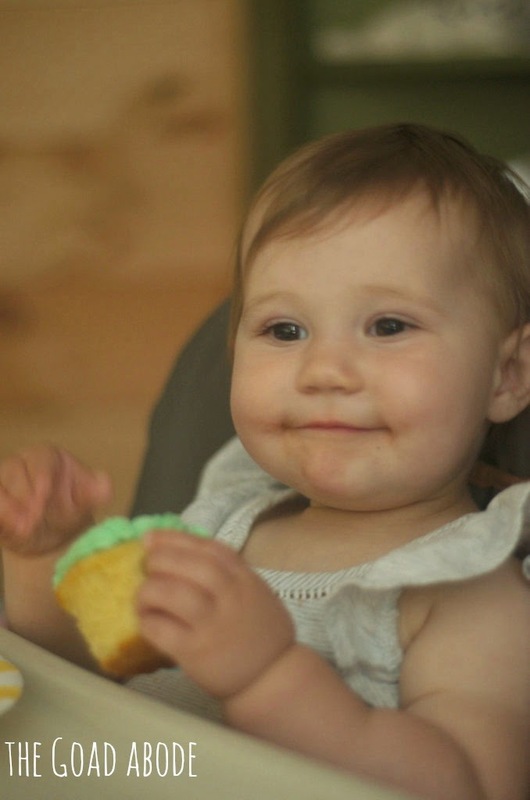 Needless to say, we did not let her eat more than a bite of frosting at subsequent birthday parties. 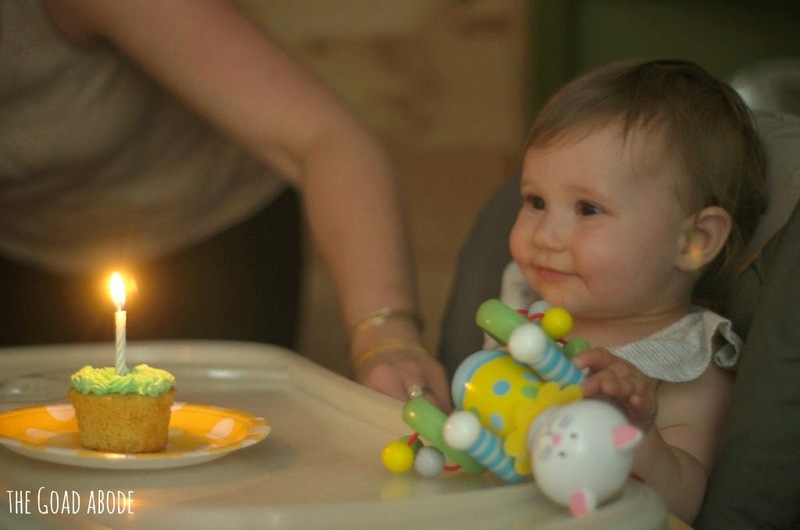 It's true, her first birthday has already come and gone. 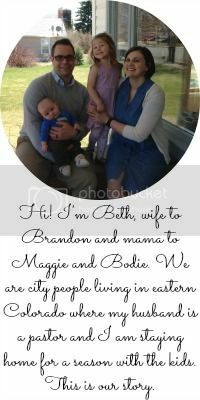 I'll be sharing more about her birthday celebrations later, but for now here's the lowdown on our sweet one year old! Maggie is quite the social butterfly these days. Whenever I take her to the grocery store or anywhere in public, she just loves smiling at everyone. Sometimes it seems like she makes a game out of finding the person who is least likely to make eye contact or return a smile with her and she just grins at them until they do acknowledge her. It's almost embarrassing...at least for her mom who does not like to be the center of attention. I tell myself she's making other's smile, so that is a good thing. 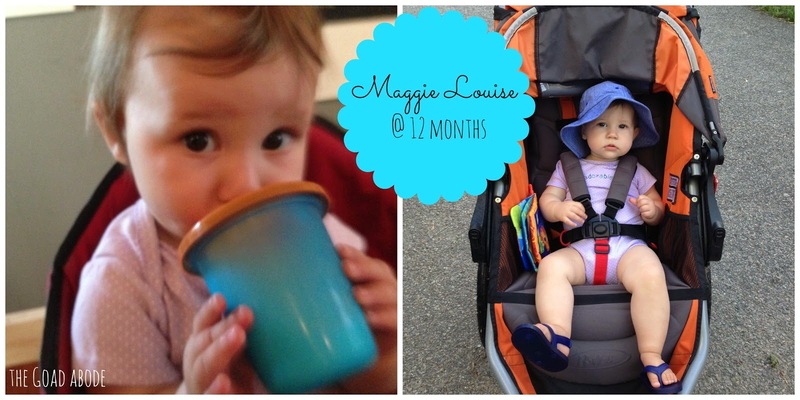 In the past month, she seems to have tried a lot of new things from holding her own sippy cup to holding things while crawling. Sometimes she carries things in her mouth while she crawls across the floor, which we don't encourage. Other times she scoot-crawls (I've yet to capture this move on camera yet) using one arm to move across the floor while seated and holding her object of choice. She can really move fast! We've spent a good amount of time outside lately and she's loved every minute of that. 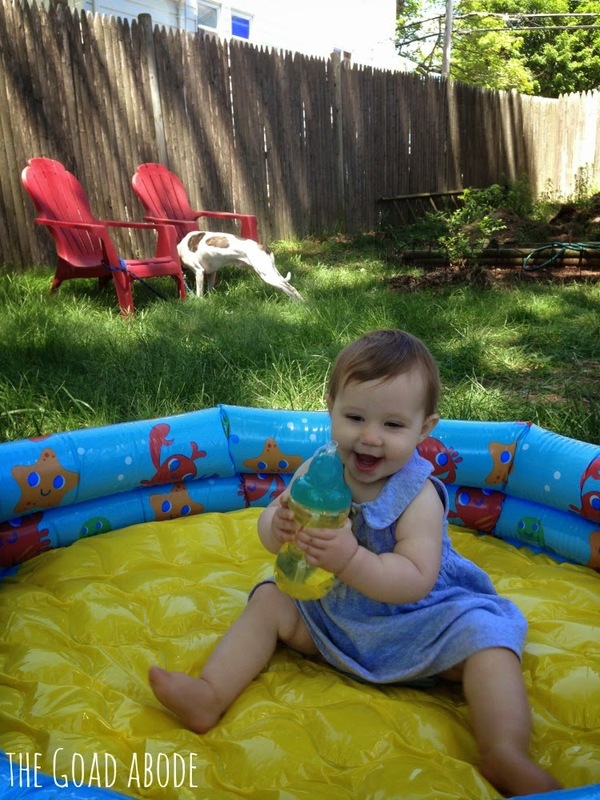 Maggie likes splashing in her kiddy pool and also had her first time in a bigger pool with her parents. She was most interested in riding on an inflated raft while we pusher her around in the big pool. Her swing! 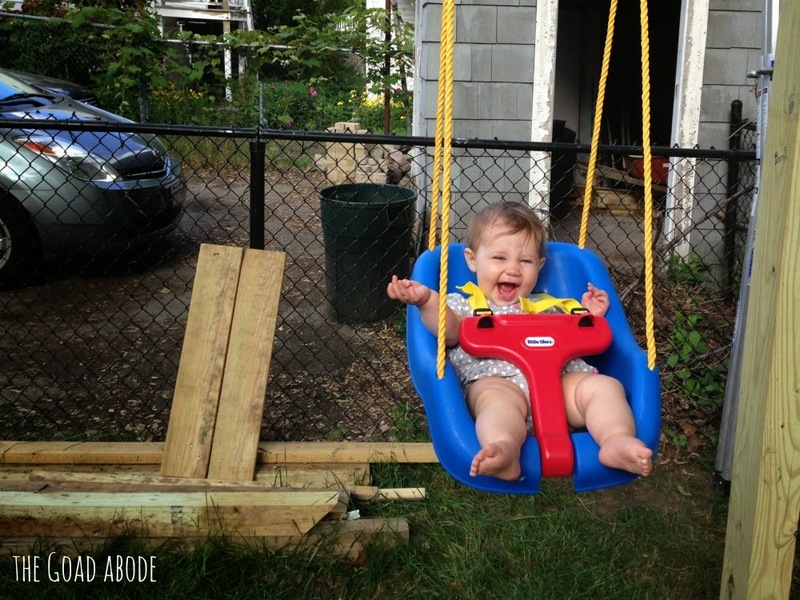 Her dad installed a swing in the backyard and sometimes I think she could stay in there all day if we let her. Drinking cow's milk from her sippy cup. It only took 2 feedings for her to hold her own cup and she really seems to enjoy drinking her milk. Bouncing. She often bounces up and down while sitting on her own. Giving kisses. This just started in the past week or so and it's super cute. She leans forward with her lips tucked in. The only downside is that she has yet to save this for family and friends. She likes almost all foods, but seems to take weeklong "strikes" from certain things. This has happened with her beloved avocado and blueberries (to name a few). Being hot. I remember her getting quite fussy as a newborn when she got hot and it seems to have carried on. Wearing shoes. I've been trying to keep shoes on her more often, since we anticipate her walkingm but she takes them off the first chance she gets. It's no surprise since she never liked wearing socks. 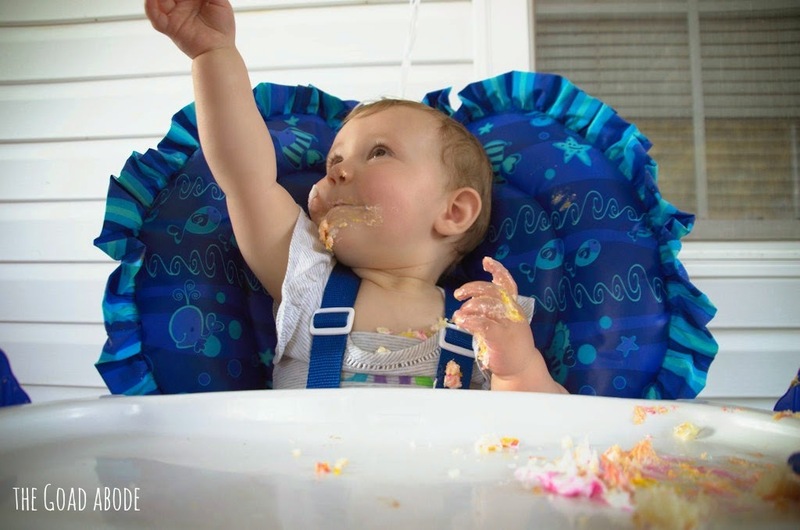 I can't wait to share pictures from her first birthday party with you!